Posted on September 21, 2018. Subscribe to our blog by email. Five months ago, I woke up in my apartment to the sounds of gunshots and teargas in the city of Managua, Nicaragua. Thursday, April 19, after a night of intense repression of peaceful protests, pro-government groups and paramilitary forces associated with President Ortega killed three protesters, and as the days, weeks and months have continued, so has the bloodshed and chaos. The week leading up to that particular Thursday, tension was high due the alleged mismanagement of a fire in a protected nature reserve, called Indio Maiz on the Caribbean coast. Once news broke that national social security reforms had been made to raise taxes and lower benefits without due process, tension only grew. The first night of protest, paramilitary forces and the National Police arrested hundreds of protesters, accosted journalists, destroyed news crews’ equipment, and incited fear throughout Managua. Alvaro Conrado, known as the child martyr of the protests, was one of the first to be killed at the hands of the pro-government factions. On April 20, he took a rubber bullet to the neck and died at age 15. He was not armed, nor was he protesting against the government; he was just at the wrong place at the wrong time, bringing water to university students in the protest. His face has since become a symbol for the protesters and can be seen all over the country. For many it serves as a reminder of why the protests are so important and why the people cannot give up. The same day Alvaro was killed, the U.S. embassy arranged for my transport out of Managua. Within hours, an embassy truck arrived with two armed guards to take me away from my apartment and on to a safer location. That weekend, the protests and violence intensified until the U.S. Ambassador decided to evacuate anyone affiliated with the embassy, including me and the three other Fulbright scholars in the country. By April 25, I was on a plane back to States, leaving behind many of my personal items, several books, various research notes, and a significant piece of my heart, leaving my friends behind without a chance for goodbye. Leading up to the explosion of unrest and violent repression, I was living in Nicaragua, completing a Fulbright research grant to study the relationship between law and application of law as it pertains to the perception and inclusion of people with disabilities in the country. In many ways, I viewed receiving the Fulbright grant as the culmination of years of involvement in the country. In October of 2017, I landed in Nicaragua for the fourth time in three years. Yet, soon after my arrival I sensed a change in the country; something was different from years past. I began my study with an analysis of Nicaragua’s constitution to give me a sense of the overall legal system, before diving into the specifics of Nicaragua’s disability law. 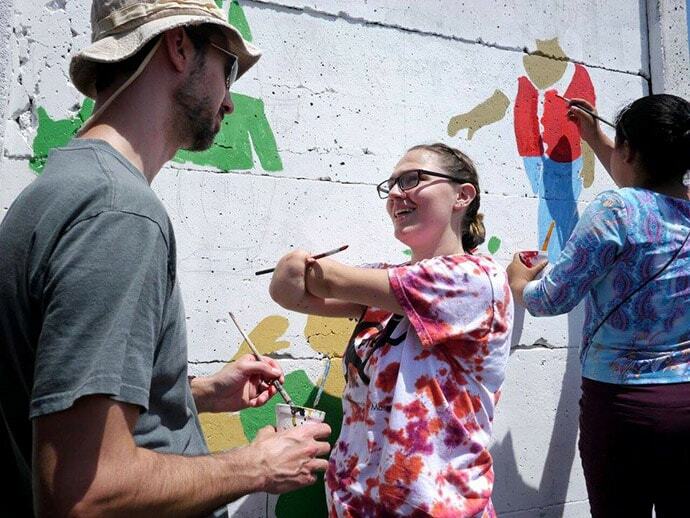 I was based at a Jesuit university in Managua, the University of Central America (UCA). When I told my colleagues and friends that I was reading the Constitution, they either laughed, rolled their eyes, or told me I was wasting my time. Like the good researcher I was attempting to become, I queried their reactions. Their responses boiled down to the following: President Ortega can and has changed the Constitution to fit his needs, so why bother believing in it or trusting the laws? Their disillusionment, apathy and frustration affirmed my original gut feeling that something had changed. This only became more clear to me after what happened when I participated in the Women’s March in Managua a month later. After weeks of hearing “why bother” and stories of apathy and resignation to an unjust system, it was refreshing to see people coming together in solidarity. I remember just how refreshing it felt because it was the day I added “refrescante” to my Spanish vocabulary – but the feeling was fleeting. As my friends and I made our way down the main highway in Managua during the Women’s March, we reached a halfway point and were met with a sea of antimotines, anti-riot police. At one point all the police officers lifted their shields and placed their masks over their faces in unison. Their primary goal seemed to be to instill fear in order to disperse the crowd. It felt like such a wild overreaction by the police to a peaceful march. Little did I know, this event foreshadowed far more volatile reactions to come. 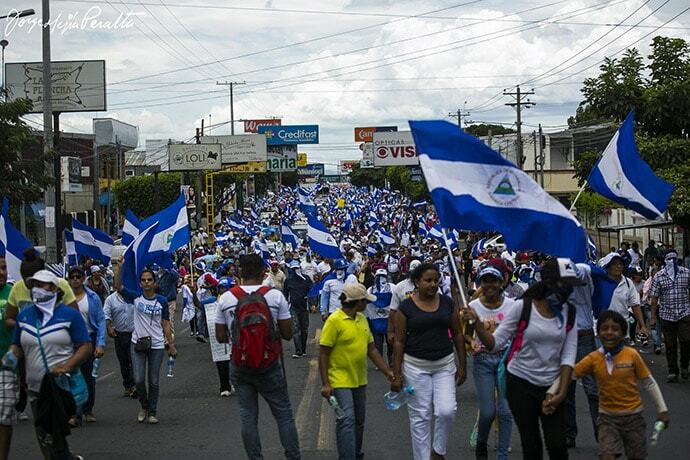 Now, the people of Nicaragua are not backing down, and neither is the government. Marches and protests have continued, albeit in smaller numbers, due to increasing fear and intimidation. Water and energy are strategically cut off in neighborhoods and towns that express anti-government sentiment. 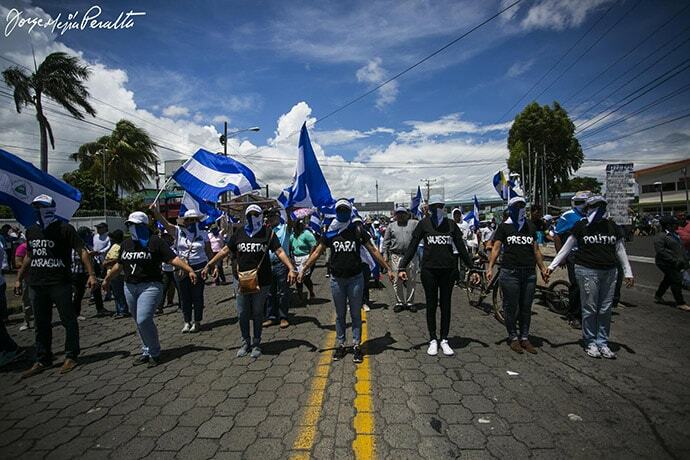 The newly approved Nicaraguan Anti-Terrorism Law has criminalized any opposition to Ortega, and students and professionals alike have been detained and persecuted. Any who oppose the Ortega-Murillo government – students, journalists and human rights defenders — are systematically followed, have their communications hacked, and are terrorized on a daily basis. Many of my friends have chosen to flee their querida Nicaragua (dear Nicaragua) to avoid the constant harassment, or have taken refuge inside their homes to avoid the ever intensifying unrest and repression. Ortega says that the protesters are terrorists, funded by the U.S. government. His supporters, commonly known in Nicaragua as orteguistas, wholeheartedly agree to this characterization. Based on a regional history wrought with negative U.S. involvement, it would not be hard for me to believe them, too. Historically, the U.S. has had a problematic relationship with Central America and Nicaragua especially, which goes back over a century, and has often involved complacency to human rights violations as long as the politics matched our own. The Nicaraguan Revolution, led by the FSLN, was the culmination of years of rising opposition to the Somoza dictatorship. The revolution coincided with the steady escalation of the Cold War and an ardent anti-communist foreign policy approach taken by the U.S., a large part of why the U.S. chose to fund the guerrillas in the Contra War. This war took the lives of tens of thousands of Nicaraguans and was the subject of fierce international debate . When President Reagan took office, the U.S. pursued a strong anti-Communist strategy for dealing with Latin America and in that pursuit broke numerous international and U.S. laws in its attempt to stifle and ultimately extinguish the Sandinista Revolution . 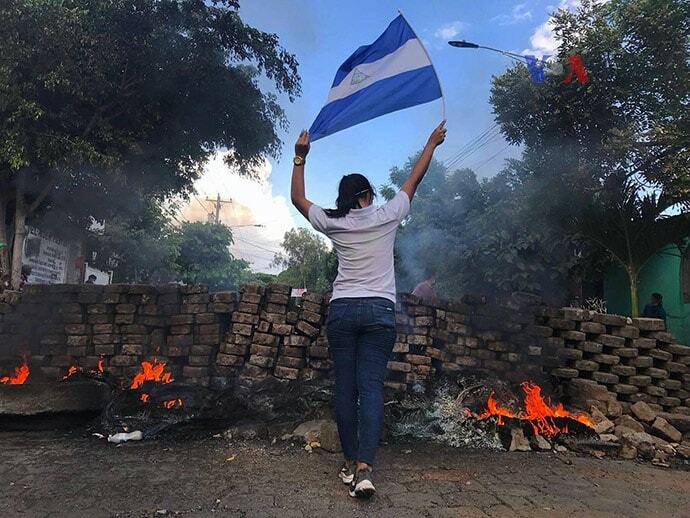 All this is to say, if I hadn’t physically been in Nicaragua when the protests of April began, and if I hadn’t been evacuated a week later, I would be a lot more skeptical of the protesters and their motivations. I might even question whether they were being used covertly by the U.S. to overthrow yet another socialist government in Latin America. However, all the facts I have, all the narratives I have heard, and what I saw firsthand, tells me this time it is different. Some protesters have resorted to violence and some police officers have died during this civil unrest, but as a whole, the pro-democracy protests have been led by student groups and young professionals looking to restore a truly representative democracy in the country. Despite being called “terrorists,” the protesters I met and observed during my time there were just a group of people who had had enough of the corruption and impunity of the Ortega government that has plagued Nicaragua for years. In a recent debate facilitated by Democracy Now!, Camilo Mejía and Julio Martinez Ellsberg discussed the current unrest in Nicaragua, and highlighted two very different perspectives on the crisis. Mejía supports Ortega and is best known for his activism as a War Resister and Peace Activist after refusing to return to U.S. army combat in Iraq. During the Nicaraguan Revolution, his parents were very involved in the Sandinista Movement and after the Sandinista victory in 1979, they were able to move to a nice Managua neighborhood where Camilo attended school with the children of government officials, including those of Daniel Ortega, while his father, Carlos Mejía Godoy, a celebrity of the Left and revolutionary songwriter, served as a deputy in the Nicaraguan National Assembly. Ellsberg, on the other hand, before leaving Nicaragua recently served as an adviser to the Coordinadora Universitaria por la Democracia y la Justicia (CUDJ), one of the main student movements opposing the Nicaraguan government and was also a part of the Platform for Social Movements, a group of diverse Nicaraguan civil society organizations which organized in response to the current crisis. Protester holding a partially visible sign with the words: “genocidal dictatorship” and “out.” August 15, 2018. Photo credit: Jorge Mejía Peralta. Ellsberg discussed his experience advising the student protesters who are fighting against the paramilitary groups and National Police. While Mejía discussed his pro-Ortega perspective and expanded upon his beliefs that are outlined in his open-letter to Amnesty International, Ellsberg questioned the legitimacy of Mejía’s authority on the topic and argued that his views and his platform combined were dangerous, especially since Mejía has not engaged with the crisis firsthand. It seems to me that Camilo Mejía’s perspective is based on dated experiences and dated information. Mejía’s talking points, in fact, line up perfectly with those used by the Nicaraguan government, stating that history is repeating itself and the U.S. is funding a coup against the socialist Ortega government. Despite the U.S. track record in Nicaragua, that is not what is happening this time. Since taking the role of president in January of 2007, Ortega has strategically consolidated power. His party, the Sandinista National Liberation Front (FSLN), has a majority in all branches of government including the National Assembly, which facilitated the elimination of term limits, making it possible for Ortega to rule indefinitely. He made his wife, Rosario Murillo, vice-president, further consolidating his power and exerting his control over the political system in the country. 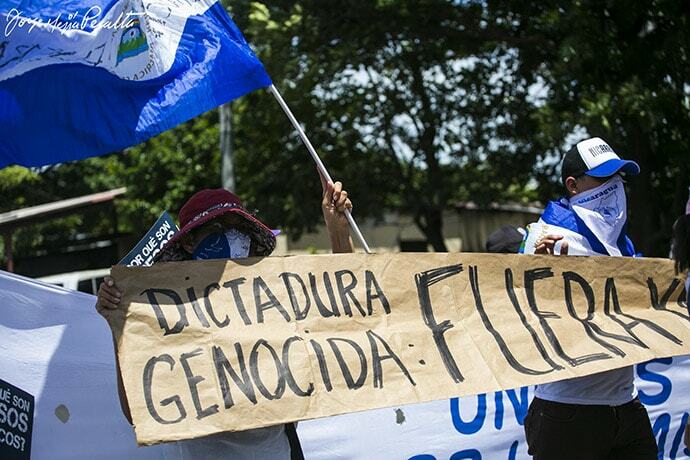 And due to harsh allegations of fraudulent elections, restriction of public services to only his supporters, and corruption under the Ortega administration, Nicaragua has been declared an authoritarian state by various international institutions and countries, including the United States. This is not to say that the U.S. has nothing to gain from the current crisis in Nicaragua. On the contrary, U.S. investors and companies have put a lot of money into Nicaragua and would benefit from Ortega’s downfall in hopes of a more capitalist system. But, at the same time, just because Ortega proclaimed himself a socialist and says he is for the people does not mean that is true, nor does it absolve him of his government’s actions. Ortega has not conceded his position on the protests, saying he will not step down or move up elections. This does not surprise me. But even if he were to step down, who would replace Ortega? He has created a culture in which only one political party has been able to thrive, so the other parties have not been able to sufficiently organize or strategize. Furthermore, with rising populism on an international scale, who is to say his replacement would not similarly restrict citizens’ freedoms or infringe on their human rights? This trend has also led to an intense increase in dehumanizing rhetoric around immigrants, especially around Central American people fleeing their countries due to violence. There are no easy answers and this issue is far more complicated than black and white. In my work and in my solidarity efforts, I try to center myself around this simple question: Whom or what do my actions serve? Are my actions serving injustice and oppressive systems, or do my actions serve the most vulnerable and in so doing bring forth (hopefully) a more just and equitable world? In responding to these questions my goal is to serve my friends and to support Nicaragua through this crisis. I choose to advocate for the respect of human rights and rule of law, to inform myself on the crisis as it unfolds, to disseminate reliable information, and to stay available to my friends and colleagues in Nicaragua as they fight for justice. 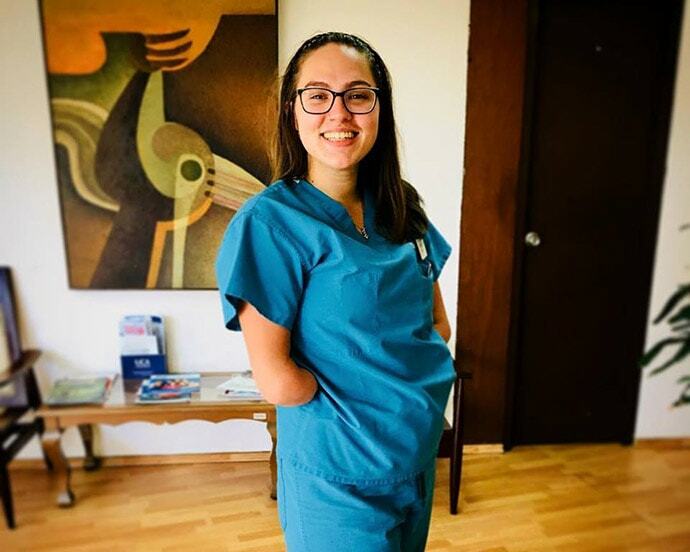 This GlobalWA blog post, entitled The Current Crisis in Nicaragua, is not an official post or site of the Fulbright Program or the U.S. Department of State. The views expressed in this blog post are entirely those of the author, Anna Pickett, and do not represent the views of the Fulbright Program, the U.S. Department of State, or any of their partner organizations, nor do they necessarily reflect the views of the Seattle International Foundation or Global Washington.